Former two-division world champion Lamont Peterson and former 140-pound champion Sergey Lipinets went face-to-face Friday at the final press conference before they meet in the main event of Premier Boxing Champions on FS1 and FOX Deportes this Sunday from MGM National Harbor in Maryland. 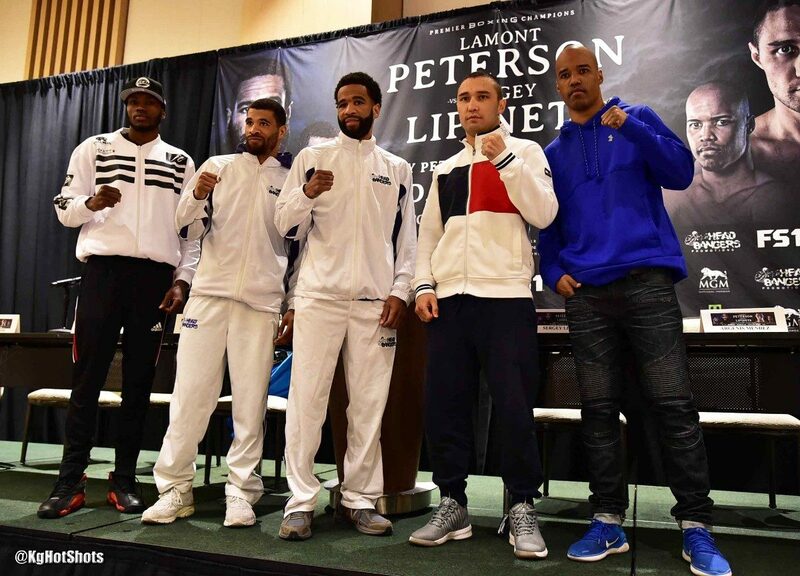 Once-beaten contender Anthony Peterson also faced off against his opponent, former world champion Argenis Mendez, as the Peterson brothers prepare to fight in front of their hometown fans as the main and co-main event in a nationally televised event for the first time since 2006. Also in attendance Friday was super welterweight contender Jamontay Clark, who faces unbeaten Vernon Brown in the televised opening at 8 p.m. ET/5 p.m. PT. Tickets for the event, which is promoted by TGB Promotions and HeadBangers Promotions, are on sale now and can be purchased by visiting www.mgmnationalharbor.com/. “I know how to keep the pressure off of myself before a fight. I know we’re at the top level and I’m facing a top guy. I’m looking to capitalize on the opportunity and move forward. “Lipinets is a tough guy. He only has about 15 pro fights, but he was able to move through the ranks pretty fast. That got my attention and lets you know that he’s definitely coming to win. “Anthony and I have fought on cards together but not on this stage for a while. I used to be nervous for him, but at this point we’re veterans and we’re just going to enjoy it. “From day one we’ve treated every opponent like a champion. We always had that mindset that we had to go out there and take care of business, and that’s not going to change on Sunday night. “Any time I fight at home, there’s a little bit more on it. It makes things easier when I’m getting through the whole progress of training camp. There’s a type of home court advantage. I knew when they opened this venue, that eventually I’d fight here. I’m going to enjoy it. “I’m very excited to be in this position and in this fight. I appreciate that Lamont took on this fight. He’s a great fighter who I respect and I’m sure he’s ready. I’m ready to make this fight goes down in history. “I know that a win over Lamont will get me the big fights that I’m looking for. I want to be a champion at welterweight and that starts with making a statement on Sunday. “I have a very tough opponent in front of me and I’m motivated by the challenge. I’m in this sport to be in the biggest and best fights. People say this is 50-50, so I’m excited to show why I’m better. “My brother and I are at a point in our career where we’re having fun. It’s like a family event. We’re going to have fun and take care of business. I’m ready to put on a big performance. Don’t blink. “I love the rush of getting into the ring in front of my hometown, that’s why I do it. The other stuff is cool, but I just love to see people excited and telling me I put on a great performance. It’s an amazing thing. “It’s been a minute since I’ve been in the ring, but I’ve been fighting and working with guys like Shawn Porter, Jarrett Hurd, Robert Easter, Adrien Broner, Gervonta Davis and my brother. I’ve been in there with all the top fighters. “I’m very happy to be here and to have this opportunity. Anthony Peterson is a very good fighter, so I’m ready to be at my best on fight night. I’m here to continue winning and leave the fans with a great show. “I’m happy to fight Anthony in his hometown. I’ve always been willing to travel anywhere around the world for fights. It’s normal to me and I’m ready for everything that comes with being the road warrior. “I’m in great shape and I’m war-ready. His 0 has to go. I’m ready for anything he’s going to bring and I’m going to put on a great performance for everyone watching. “I want to see the dog in Lamont in this fight. I want to see the smart fighter that he’s always been. I think the rest has done him a lot of good. He’s got his mind and his body right. He looked at me on day one and I could tell he was ready to roll. Peterson vs. Lipinets is a Premier Boxing Champions on FS1 and FOX Deportes event that is headlined by former two-division world champion Lamont Peterson taking on former 140-pound champion Sergey Lipinets in the main event. In the co-main event Anthony Peterson, Lamont’s brother, will face former champion Argenis Mendez, plus super welterweight contender Jamontay Clark takes on unbeaten Vernon Brown as part of the telecast beginning at 8 p.m. ET/5 p.m. PT. Fans can live stream the fights on the FOX Sports app, available in English or Spanish through the FOX, FS1 or FOX Deportes feeds. The fights are available on desktop at FOXSports.com and through the app store, or connected devices including Apple TV, Android TV, Fire TV, Xbox One and Roku. Previous boxing news: Could Bob Arum’s vision be sharper than ever?